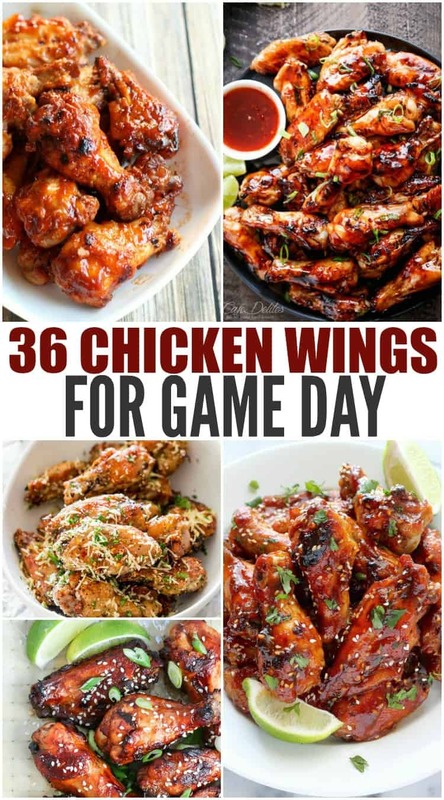 If you will be watching the big game you will want to check out these 36+ Chicken Wing Recipes for Game Day. Tons of different wing options from some fellow bloggers for you to consider making. We have baked and fried. We have sweet, spicy, citrus, hot, mild, tons of different flavors for you to consider serving up! I have shared a couple of our favorite Chicken Wing Recipe here on my blog. Be sure to see our No Fry Chipotle Honey BBQ Wing Recipe and also our No Fry Buffalo Wing Recipe. These are my go to recipes! Sweet & Spicy Sriracha Wings – from Baked by Nature -These wings are spicy, crunchy, and saucy on the outside; tender, meaty, and luscious on the inside. Sticky Thai Wings – by Cafe Delites -Sticky Thai Chicken Wings glazed with a sticky sauce infused with authentic Thai flavours you most probably already have on hand in the kitchen! Crispy Salt & Pepper Wings – by Jo Cooks – these will probably be the simplest and most amazing wings you’ll ever make. Generously seasoned with salt and pepper and baked to a crisp perfection! Honey Lime Wings – by Paleo Omg – They are so freaking easy, so flavorful and the dip almost has a sour cream cooling feel to it. Parmesan Wings – by Jo Cooks – These chicken wings are baked crisp to a golden perfection, then smothered in a Parmesan cheese, parsley and chili flakes mixture. It’s finger licking good! Crispy Asian Wings – by What Should I Make For – Hot and spicy, but not so hot that I can’t feel my face, but not so mild that I don’t need to have my beer handy to take the edge off. Honey Garlic Wings – by Baked by Nature – Dangerously easy to make and eat! Sticky Asian Wings – by Garnish with Lemon -Sticky, sweet and full of flavor, guaranteed to be a hit at your next party! Apricot BBQ Wings – by Mom Endeavors -These wings could NOT be easier to make and they’re totally kid friendly too. Cranberry Pomegranate Wings – by Urban Bliss Life -elegant, delicious, and satisfying enough for all fall/winter occasions! Fajita Wings – by The Bewitch in Kitchen -clean eating, Whole 30 and paleo approved! 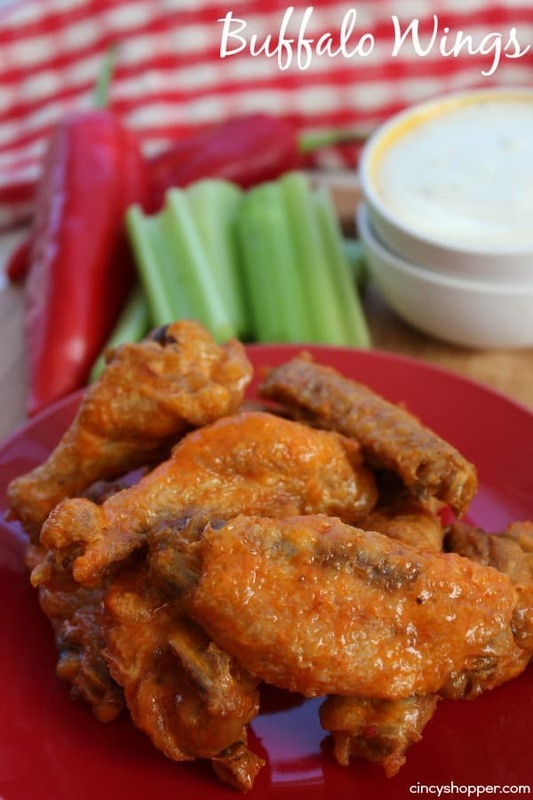 Honey Chipotle Wings – by Life Love Liz -perfect to serve for the big game! Crispy Pineapple Wings – by Domestic Dee -These sweet, tangy, crispy, baked pineapple chicken wings are so succulent they will have you licking your fingers…I promise! Crispy Hot Chicken Wings – by Perpetually Hungry Blog -Even though they’re pretty spicy – we’re using a lot of cayenne, the brown sugar gives the wings a slightly sweet undertone that makes them so delicious! Bourbon & Honey Wings – by Bourbon and Honey -These chicken wings are sweet, sticky and oh so worth it! They’re baked, which makes them easy and the sauce is quick to make and super flavorful. It’s perfect for tailgating, game day or everyday! Lime Apricot Wings – by Panning the Globe – Lime juice, apricot preserves, garlic and soy sauce meld and caramelize with wings as they cook. They emerge from the oven sweet, tangy and delicious. 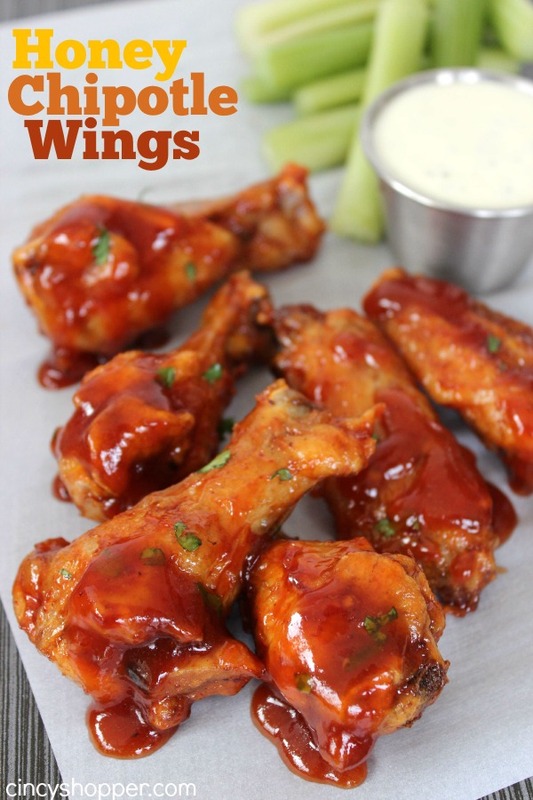 Chipotle Butter Beer Wings – by Self Proclaimed Foodie -tender mouthwatering chicken wings with a sweet and spicy sauce that will have you licking your fingers and asking for more. Honey Sesame Wings – by For Aged Dish -the star of our game-watching festivities. Salt & Vinegar Wings – by Ournumbered 3 to 1 – If you are a fan of vinegar flavors… you will love these wings. Spicy Teriyaki Wings – by Jamie Loves Stuff – These wings are sweet and spicy. Oh and really, really, REALLY messy. Lemon Pepper Wings – by Tabitha Talks Food – The chicken will take about an hour til they’re crispy and fully cooked. You’ll just take them out and add some lemon pepper butter sauce! So easy. Spicy Peri Peri Wings – by Salu Salo – After marinating the wings in the Peri Peri sauce, the wings are simply baked in the oven. The result is the spiciest wings that I’ve ever made. They came out full of that garlic, lemon and spicy flavor. Mango Lime Wings – by Bio Hackers Recipes – combines a simple mango sauce made up of mangoes, lime and parsley to make a sweet citrus chicken dish. Spicy Orange Wings – by The Cozy Apron – sweet and spicy orange sauce tossed together with crispy chicken wings is delicious and crave-worthy. Nashville Hot Fried Wings – by Cooking with Janica – delicious fried chicken brushed with the perfect spicy glaze…what’s not to love? Sticky Honey Wings – by Easy GF Recipes – Baked chicken wings with ginger, lime and honey sauce. Sweet & Sour Wings – by What Grandma Ate – I love the combination of sweet and sour. Chimichurri Wings – by Real Food with Dana – All sorts of AMAZING flavors going on in these wings! Garlic Parmesan Wings – by Joyful Healthy Eats – baked instead of fried but these classic chicken wings are still as crispy and delicious as ever! The perfect party appetizer or game day treat! Blueberry Lemon Wings – by Redhead Baker – These spicy-sweet chicken wings are coated in a glaze of Smucker’s Fruit & Honey Blueberry Lemon Fruit Spread, shallot, vinegar and chipotle chili powder. Honey Buffalo Wings – by Kitchen Swagger – Crispy baked honey buffalo wings are sweet, spicy, and ready for game day. Better yet, these wings will please both teams—slightly spicy, but sweet enough to serve as a mild buffalo wing. Ginger Garlic Wings – by Kitchen at Hoskins – Chicken wings without all the hassle of deep frying. Marinade wings in a very flavorful ginger-garlic-lemon-spice paste for several hours. Mango Habanero Wings – by Maley Berry’s Kitchen – These are baked and served up with a finger lickin’ good sweet and spicy sauce! Firecracker Wings – by Sweetie Pie and Cupcakes – The combination of sweet honey and spicy sauces will have your mouth watering for more! Thai Chili Lime Wings – by Salu Salo – These wings are a little different than the other two because the addition of Thai chilies in the marinade adds a nice kick to it. The combination of the spices with the lime and the Thai chilies creates such a wonderful and complex flavor. 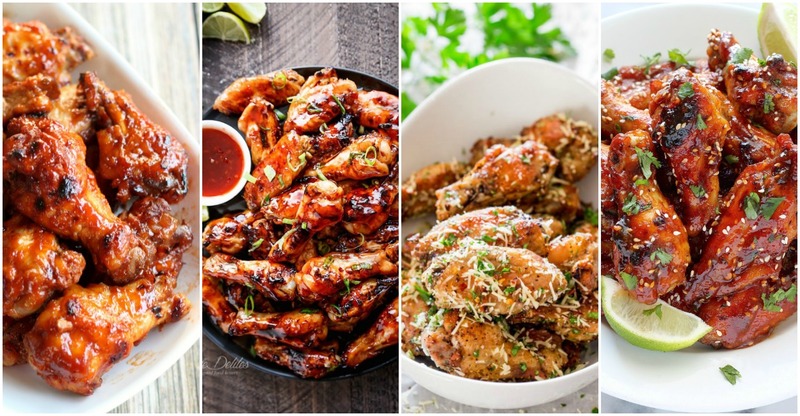 All of these wings sound scrumptious and perfect for the BIG GAMEDAY. Thanks for including my fajita wings!